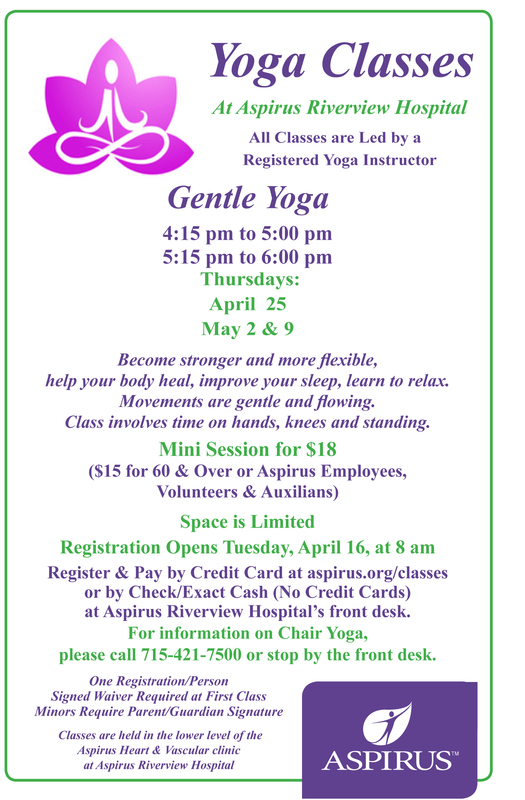 Aspirus Riverview Hospital will host a series of Gentle Yoga classes beginning April 25. Classes will be held Thursdays, April 25, May 2 and May 9 from 4:15 to 5 pm or from 5:15 to 6 pm. Participants may select the class time they prefer when registering. Gentle Yoga participants learn to become stronger and more flexible. The class’ gentle, flowing movements involve time standing as well as on hands and knees. The class is designed to help with healing, sleep and relaxation. All classes are led by a registered yoga instructor. The cost of each three-session series is $18 ($15 for those 60 and over, Aspirus Riverview employees and volunteers, and Aspirus Riverview Auxiliary members). Gentle Yoga registration opens Tuesday, April 16, at 8 am. 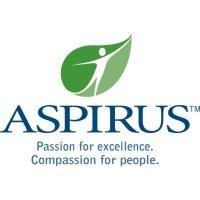 Participants may register and pay by credit card at aspirus.org/classes-events or by check or exact cash (no credit cards) at Aspirus Riverview Hospital’s front desk. Space is limited, and only one registration per person is accepted. A signed waiver is required (available at first class). Minors require the signature of a parent /guardian. Aspirus Riveview Hospital also offers Chair Yoga classes on an ongoing basis. For information about Chair Yoga, please stop by the Aspirus Riverview Hospital front desk or call 715-421-7500.